Grew up in Kettering. Now a Springboro resident for the past 36yrs. Married to Barbara for 37yrs. Have also been in the car business for 38yrs. Have three boys ages 30, 27 and 23. Big hockey fan and Buckeyes fan. Brady is in his 8th year at Joe Morgan Honda. He has been in sales and management for 12 years. Before becoming a Sales Manager, he was the top Sales Consultant for the Voss Auto Network. Brady is a Council of Sales Gold Master award member. In his spare time he likes spending time with his three children and wife, coaching youth baseball, running, watching the Cincinnati Reds and Minnesota Vikings, Brady has a passion for everything automotive, sport, and finance related. Lives in Monroe. 8 years Joe Morgan Honda. Loves Xavier basketball. 30 plus years in the automobile field. Beth started with Joe Morgan Honda in 2018. She handles all of our sales internet inquiries. She is an avid animal lover and has more than 35 years in the automotive marketing field. Lives in Mason, has 16 years automotive experience. 15 years with Honda and 6 years at Joe Morgan Honda. Likes spending time with family, grilling out and watching our local teams. Huge Georgia Bulldog fan. Pat's large customer base, loves him and keeps coming back. 2 time Honda Council of Sales Leadership Platinum member. 5 years at Joe Morgan, 10 years with Honda and 20 overall in the business. Avid bicyclist, and golfer. Lives in Liberty Township. Honda Council of Sales Leadership Platinum member. In 2017 was named Top Performer with Honda which puts him in the top 43 sales people in the entire nation. Come see Nick for your new or pre-owned Honda. Dwayne has been at Joe Morgan Honda for 6 years. He lives in Monroe. Honda Council of Sales Leadership Gold member. Dwayne is also an adjunct professor of biblical studies and holds a PH.D Dwayne's large customer base keeps coming back due to his excellence in communication and care for all his customers. 3 years at Joe Morgan, 9 years automotive experience. Taught in China for 6 years and 4 years MRDD in Dayton. Numerous mission activities. Loves to swim and enjoys ball room dancing. Traveling, visiting 35 Countries around the world. Honda Council of Sales Leadership Gold member. Larry has been at Joe Morgan Honda for over a year now. Larry holds multiple college degrees in communications. He has been professor at NKU. Larry looks forward to assisting his customers in finding the car that fits them best. 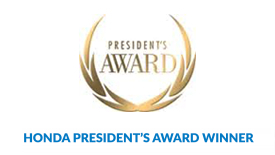 He was a Honda Council of Sales Leadership Silver award winner for 2018. Steve started at Joe Morgan Honda in 2018. Steve has been in the car business for a few years now. Steve takes pride in helping his customers make the best decision. He is a proud father and husband.